Real Angel Footage Captured In Indonesia? Did we finally capture a video of a real angel in Indonesia? These day’s there are plenty of videos and pictures of ghosts, bigfoot, demons etc.. But not of angels. And that is why I love this footage so much. It’s very enjoyable to watch and I am sure the religious people of the world just love this footage, I know I do. The footage below was taking at a mall in Indonesia. 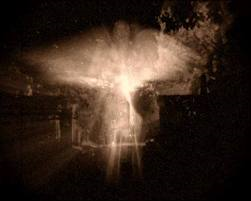 It appears to show an angel falling down to earth at an incredible high-speed, crashing to the ground for a split second then flying back up to the heavens. The One thing that really stands out in this video is how bright the object is, like an arch angel glowing in all his glory. There is no doubt that a lot of people are saying this video is nothing more than a cleaver hoax, as 99 percent of these type of video’s usually are. But I would have to admit this footage is a little unique, at least to me. After this object lands and fly’s back up you can see the security guards running to the location to investigate, looking extremely confused, like they just saw a ghost. Which to me gives this footage a little more credibility. This footage is not brand new, I think it might be a couple of months old by know. But I really enjoyed watching it over and over when I first saw it. So I wanted to upload it to my blog for all my fellow paranormal junkies to watch, just incase you haven’t seen it before. I am sure you will enjoy it as I did, even if it is a hoax I still find it very entertaining. Tell me in the comment section below what you think. Real angel taking a break from his heavenly duty’s to do some shopping at an Indonesian mall, or just a clever hoax? As always make sure to like, share and invite your friends!